Berlin is a large and well-known city in Germany, the country’s capital, and a home to many memorials and commemoratins in regards to the Holocaust. 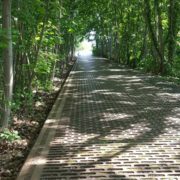 These sites are incredibly impactful and they cause people to draw very different interpretations based on their personal knowledge and experiences. 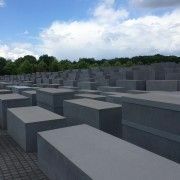 On a recent weekend trip to Berlin, we visited the Holocaust Memorial, which included the “Memorial to the Murdered Jews of Europe”, “Memorial to the Homosexuals”, “Memorial for the Victims of the Euthanasia Killings”, and the “Sinti and Roma Memorial”. 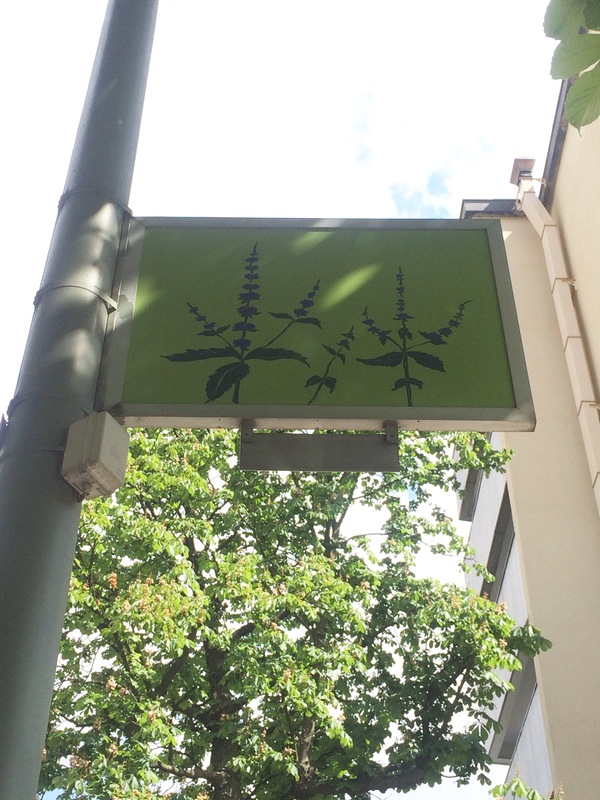 We also visited the “Places of Remembrance”, and happened upon the “Stumbling Stones” in the Bavarian Quarter. 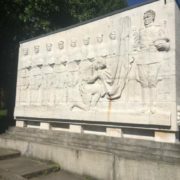 The differences that I found among these monuments were substantial, and they allowed me to interpret each of them differently with my own views and emotions. The “Places of Remembrance” is a memorial, and is very much an “in-your-face” type of memorial. 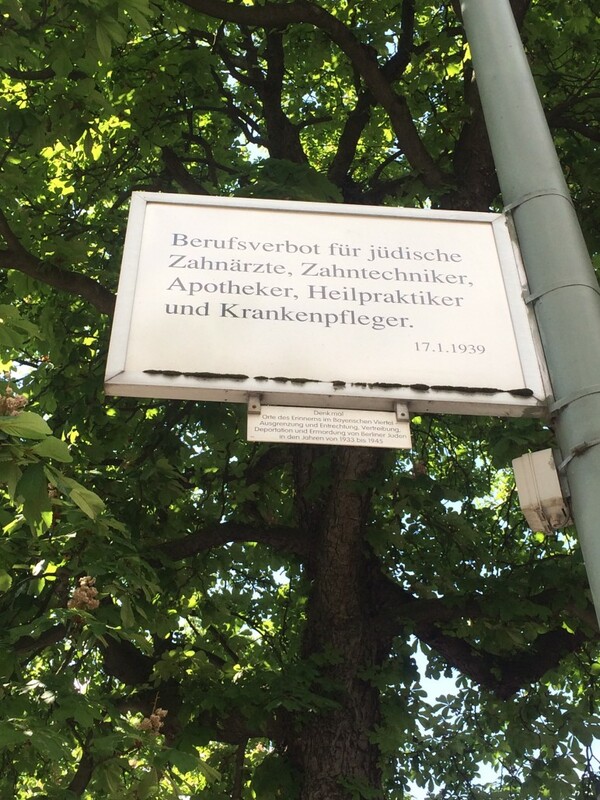 Walking along the streets of the Bavarian Quarter, all you have to do is look up to see these signs that reflect former laws placed on the Jews and others during the Nazi regime. Upon further inspection, it can be noticed that these signs are in the present tense, making the observer think about the laws that were in place then, and imagine them if they were in place today. 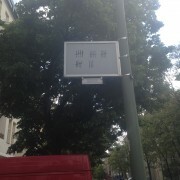 Seeing this actually sickened me, as the progression of the laws on the signs stripped more and more rights away from the Jewish citizens of Berlin and Germany. Nazis had the intention of excluding Jews from daily life, as well as social structures, and threatening their well-being. These former rules and regulations demonstrate these intentions, and are ultimately unsettling. To those who don’t understand the intention of these “Places of Remembrance”, it may seem anti-Semitic, but its use is for the opposite effect. The designers wanted people to think and talk about what happened and not forget about the Holocaust as time goes on. Seeing these “Places of Remembrance” allowed me to imagine what Jewish people had to go through, and made me imagine what it would be like if something like this happened in today’s world. Also while in the Bavarian Quarter, we happened upon the “Stumbling Stones” which were small stones in the pavement in front of buildings where Jewish people lived, or sometimes in front of new buildings that were built in places of those where Jewish people had lived. These stones are small, and include “Hier wohnte” (here lived), their name, date of birth, and where they were murdered. These stones are subtle and often unnoticeable, but show up randomly and are a small reminder of the former citizens of the city who were murdered. 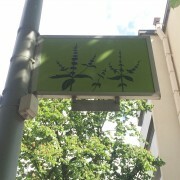 While walking around, a German woman approached us and explained the stones that were placed in front of her building. She spoke of how the Jews ran the pharmacy, but were no longer able to due to the laws captured in the “Places of Remembrance.” She also spoke about how Speaking with this woman made me think about how current residents of the buildings may feel about having these constant reminders in their daily lives. To an outsider, happening upon one of these stones is a jolt to their memories, and makes them think about the history that is the cause of their presence. Discovering these stones, even while not in the Bavarian Quarter, gave me a sharp reminder of what had happened, and of the people that had lived here. These are simple memorials to the former residents of the area, giving history a constant reminder of what happened, and a warning of what should not be allowed to happen in the future. The Holocaust Memorial in the center of Berlin is completely different from these two memorials. This memorial is made up of four smaller memorials for the separate groups exterminated during the Holocaust. 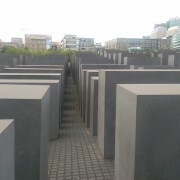 Walking through the “Memorial to the Murdered Jews of Europe” was an indescribable experience. 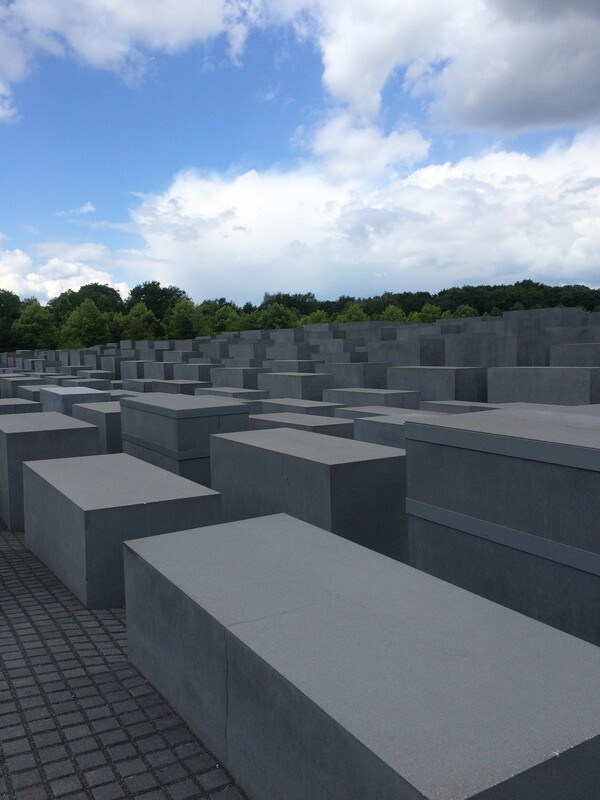 It is a large, expansive collection of 2,711 gray concrete slabs, called stelae. Walking into these stelae, a person may not know what this memorial is for, as it is not explained anywhere. There were children running everywhere, screaming in the process, as well as adults climbing all over the stelae. The lack of respect that visitors had for this memorial was astounding. These people could not or did not care to understand what this memorial was for, and it offended me. This memorial was difficult to interpret, as it was very vague. Ultimately, I believe that it did not do justice to those whose lives were taken during this horrific genocide. The “Memorial to the Homosexuals” was just as vague as the previous memorial. It was of a similar shape to the stelae, but it was much larger and inside of it was a video showing a tender moment between two men. What struck me was the lack of other sexes and genders in this memorial. This was later referenced in the description of the memorial, which was located a distance away from the actual memorial. The Nazi party found homosexual men as a threat to their perfect race, so this is why they were targeted. 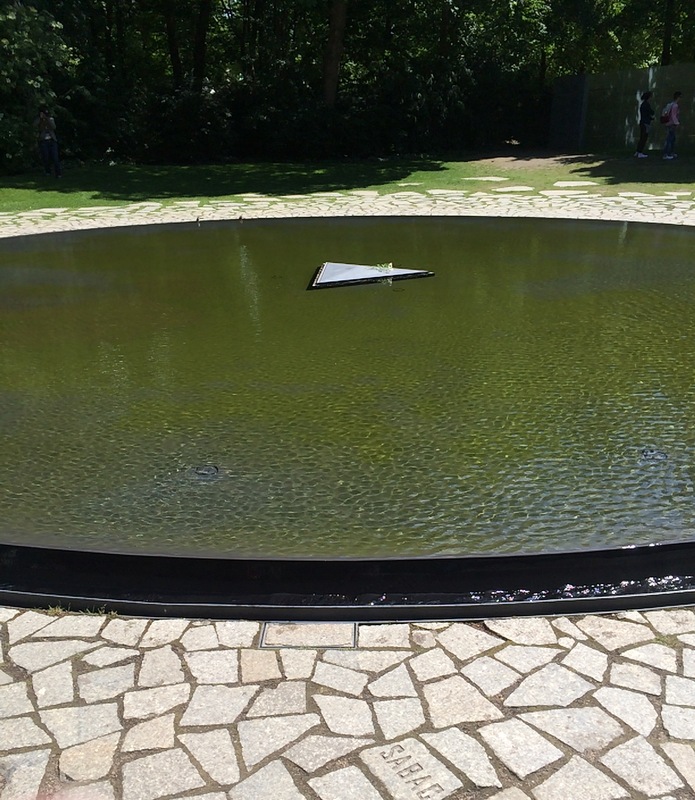 Knowing this, I understood why the memorial was designed like this, but I still believe that it did not do the victims justice. These victims deserve more than just an ambiguous memorial; they deserve something that celebrates them as humans, and not just imperfections of the Third Reich. Other memorials within the Holocaust Memorial were more descriptive and reflective. 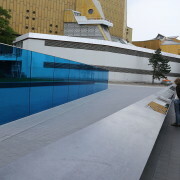 The “Memorial for the Victims of the Euthanasia Killings,” while informative, was difficult for me to view and process. 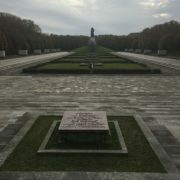 Prior to visiting this memorial, I did not know what Nazi officials and doctors did to people with disabilities and hearing of their terrible treatment and murders really disturbed me. It made me understand the brutality to which different groups were subjected during the Holocaust. Being able to see the descriptions of what they endured helped me comprehend what this memorial was built for, and really reinforced the fact that humans sometimes take very inhuman actions. 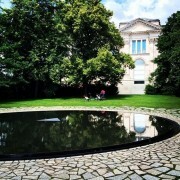 The “Sinti and Roma Memorial” was the most beautifully designed and it was very conducive to reflection. 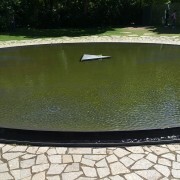 Violin music accompanied the reflective pond in an understated way, allowing me to reflect on the peoples’ misfortunes, and to more fully appreciate the purpose of this memorial. Secluded from the rest of the Tiergarten Park, this memorial was very serene, despite the large number of visitors. Being in this space allowed me to imagine how the Sinti and Roma were impacted by the Holocaust, and how life goes on around us. Despite all of the differences in memorials, they all had the same intent: to honor those who perished during the Holocaust. Some memorials forced you to dig deep to interpret the meaning of the memorial, and others made you come to the uncomfortable realization that some human beings, as well as human behavior, is horrible and inexcusable. These memorials were created to remind us of the history behind them, in order to prevent something like the Holocaust from happening again. Memorials are open to interpretation, but are ultimately created as a reminder of what occurred in the past, and to honor victims. Without these memorials, history may fade away, as well as the memory of the victims and their suffering. 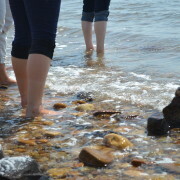 All pictures included in this essay were taken by Megan Gorenflo.